I am involved in a new project called History Leaks. The purpose of the site is to publish historically significant public domain documents and commentaries that are not available elsewhere on the open web. The basic idea is that historians and others often digitize vast amounts of information that remains locked away in their personal files. Sharing just a small portion of this information helps to increase access and draw attention to otherwise unknown or underappreciated material. It also supports the critically important work of archives and repositories at a time when these institutions face arbitrary cutbacks and other challenges to their democratic mission. I hope that you will take a moment to explore the site and that you will check back often as it takes shape, grows, and develops. Spread the word to friends and colleagues. Contributions are warmly welcomed and encouraged. Any feedback, suggestions, or advice would also be of value. A more detailed statement of purpose is available here. Yesterday a copy of the Bay Psalm Book, the first book composed and printed in British North America, sold at auction for a record-breaking $14.16 million. Members of Boston’s Old South Church decided to sell one of their two copies to help fund their cash-strapped congregation, and while the amount fell short of the auction house estimate of $15-30 million, it is certainly enough to buy a whole lot of snazzy sermons, baptismal fonts, and really uncomfortable pews. A number of talented and distinguished historians, including Jill Lepore and David Spadafora, have weighed in on the broader context and significance of this standard devotional text, printed in the fledgling Massachusetts Bay Colony in 1640. Amid all of the excellent scholarly analysis and public humanities work, however, no one seems to be asking the big question: why is someone willing to pay millions of dollars for a book that anyone with an internet connection can get for free? In an age of increasingly universal digitization, when nearly every major print publication prior to 1923 is available online, why do some public domain printed books sell for princely sums? In 1947, when the last Bay Psalm Book sold at auction for $151,000, a researcher needed to physically travel to a major library in order to view an original copy. In the Northeast, there were plenty of options – Yale, Harvard, Brown, the Boston Public Library, the New York Public Library, the American Antiquarian Society. South of New York City, there was nothing. West of the Appalachians, the only choice was the private Huntington Library in California – and their copy was missing seven pages, including the title page. The only copy available to researchers outside of the United States was at the Bodleian Library at the University of Oxford. Bibliophiles published facsimile editions as early as 1862, but their production and circulation were limited. Depending on how far one had to travel, and factoring in layover times, scheduling, family and work obligations, and local arrangements, the onetime cost of consulting this small piece of religious history could be enormous. Gripes about the digital divide notwithstanding, the analog divide was and is much worse. In 2013, copies of the the Bay Psalm Book are everywhere – the Library of Congress, the World Digital Library, even the Old South Church. In fact, almost every single book, pamphlet, and broadside published in colonial America is available for free online or at a participating library through Readex’s Early American Imprints series. Yale’s copy of the Bay Psalm Book, which, coincidentally, was the one purchased at the aforementioned auction in 1947, is available in full here. That book sold for the equivalent of about $1.5 million in present-day terms. No copies of this august tome have been discovered or destroyed since 1947. So why is the same book worth over $14 million today? What accounts for this tenfold increase in value? I can think of several reasons why someone would pay so much for a book that is available to everyone for free. If there are significant deviations or marginalia between and among different copies or editions, each copy is more or less unique and thus uniquely valuable. Yet the differences among the various Bay Psalm Books are fairly well documented by this point and are not that extreme. Another reason might be personal profit or prestige. To his credit, David Rubenstein, the billionaire investor who purchased the book at yesterday’s auction, plans to loan it out to libraries around the country and to place it on deposit with a public institution. Although he may derive a good deal of personal satisfaction from this arrangement, I do not think that private gain is his primary goal. That leaves one more motive – the simple pleasure of the physical artifact. The Early Dawn – rarer than the Bay Psalm Book and just as significant, but considerably less expensive. Courtesy of Special Collections, Yale Divinity School Library. This is nothing new, of course. Since the days when early Christians passed around the head of Saint Paul or the foreskin of Jesus, and probably long before that, people have always been fascinated by sacred relics. Presumably, this is why so many tourists flock to see the original Declaration of Independence or the Wright Flyer in Washington D.C. One can read almost everything there is to know about the Declaration or the Wright brothers on an iPad while waiting in line at Stop & Shop, but there is something ineffably special about being in the presence of the real thing. Even so, what justifies such an outrageous price tag? There are almost a dozen copies of the Bay Psalm Book, all available, to some extent, to the public. And there are plenty of rare and valuable historical documents that seldom see the light of day. A few years ago, I found an 1864 edition of the Early Dawn for sale online for less than $200. 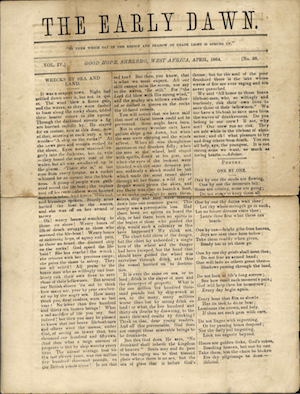 Published by American abolitionists at the Mendi Mission in West Africa starting in 1861, it is a periodical that ties together the struggles against slavery and racism across two continents. It is invaluable to our understanding of global politics, history, religion, and the state of our world today. In this sense, it is just as significant as the Bay Psalm Book. It is also extremely rare. As far as I know, there is only one other extant issue from the same time period. Fortunately, I was able to convince my colleagues at the Yale Divinity School to purchase and properly preserve this one-of-a-kind artifact so that it would be available for future researchers (click the image above for a full scan of the paper). I am sure that every historian who has worked on a major project has a story similar to this. If not an online purchase, then it is a special document found in an archive, or an especially moving oral history. There are countless unique and historically significant documents and manuscripts moldering in libraries and repositories around the world. Some of them are true gems, just waiting to be discovered. Most of them remain unavailable and unknown. And yet our society sees nothing wrong with a private citizen spending a small fortune to acquire a copy of the the Bay Psalm Book. There is no question that the venerable Old South Church deserves our support, and I have no doubt that its congregants do important work in their community and abroad. But how many lost treasures could have been brought to the world for the first time for the cost of this single public domain text? How much digitization, transcription, or innovation could $14.16 million buy?